The official, Abdallah Lawadeh, said the land had already been bulldozed and temporary houses have been set up for Israelis. The 255 homes to be built in the area are part of a planned 800 houses designated by Israel since October for construction in Judea and Samaria. 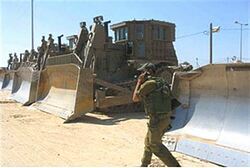 According to the far-left Peace Now organization, on November 7 the army approved construction on the 255 units in Nahalei Tal, an outpost that was connected to the national infrastructure in 2005. The move comes ahead of US Secretary of State John Kerry’s return to Israel this week to push peace talks between Israel and the PA.
Those talks have largely been a failure. Furthermore Kerry’s threats of a “third intifada” if talks fail was quickly followed by an upswing in terror attacks, and has proved to be a diplomatic disaster for US-Israel relations. Meanwhile PA Chairman Mahmoud Abbas has threatened to “take action” through international bodies against Israel should the talks fail.